While we live strictly by the “any body is a bikini body” motto, we understand even the most self-accepting, body-positive ladies among us dread slipping into a bathing suit when we feel bloated. There are a few gut-busting foods we can eat to help keep us feeling our best during swimsuit season. Here are a few tips from Neka Pasquale, Urban Remedy founder and certified Chinese nutritionist. She gives us a closer look at the real causes of bloating, plus seven good-for-you foods that’ll keep it at bay all summer long. Asparagus: contains the amino acid asparagine, which is a natural diuretic. It releases excess water from the body and clears excess salts as well. Leafy Greens: Collard greens, spinach, kale, and other deep leafy greens work well to reduce bloating because of their high-water content. They’re also natural diuretics and beneficial to gut health because they provide minerals and vitamins. 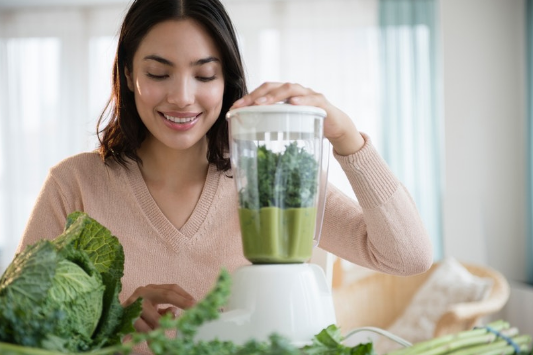 Check out this recipe for a collard green smoothie! Seaweed: Pasquale says that ancient Chinese medicine claims, “There is no swelling that is not relieved by seaweed.” It has been used for thousands of years for its diuretic properties. Look for seaweed salads in the cold case of your local gourmet grocer, or head out for a sushi dinner to get your seaweed fill. Cucumber Juice: Yet again we have a natural diuretic in the mix! Cucumber juice “flushes excess water out of the body via urination. Like a river flowing, it pulls debris on its path, a diuretic flushes toxins and waste via urination, leaving you less bloated and feeling lighter,” Pasquale says. Try subbing cucumber sticks for pita chips the next time you dip into hummus for your 3pm snack. Fennel: Fresh fennel is tops when it comes to vegetables that support digestion. Bloating, gas, intestinal cramps, and irritable bowels are all good reasons to eat fennel. You can also use the seeds by making a tea or even chewing them after meals. Ginger Root: Ginger has long been a go-to ingredient in our detox regimens — and is an amazing natural antidote to morning sickness. Ginger “stimulates the digestion and aids in transforming and transporting the fluids in the body. Phenolic compounds like gingerol are primarily responsible for ginger tea’s positive effect on the digestive system. Drinking a hot ginger tea just before a big meal or sipping on a small cup of it while eating to reduce bloating and support digestion. Turmeric Root: From face masks to golden lattes, turmeric is one of our favorite wellness ingredients. It helps brighten skin, reduces inflammation, and even combats fatigue. Pasquale adds that turmeric can also “strengthen digestion, support liver detoxification, and lower inflammation. Turmeric root has been used in Ayurvedic medicine for thousands of years as a sattvic herb, which means it has purifying and balancing properties. As a tridoshic herb, it is tonifying and healing for all body types.” Add turmeric to your tea or a mug of hot water with fresh lemon juice and cayenne pepper in the mornings and see if it stops bloating during the day.